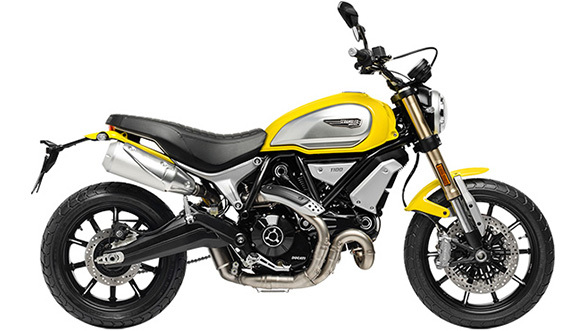 The Ducati Scrambler 1100 is a motorcycle that builds on the momentum that the Scramber 800 has created. The product designers clearly asked themselves what this customer was looking for. What would the upgrader look for? What would someone looking for a bike larger than the Scrambler, but of the same nature want? Ducati doesn't ever mention the resurgent hipster, I mean, retro market but surely, the success of the RnineT is not lost on Borgo Panigale, right? 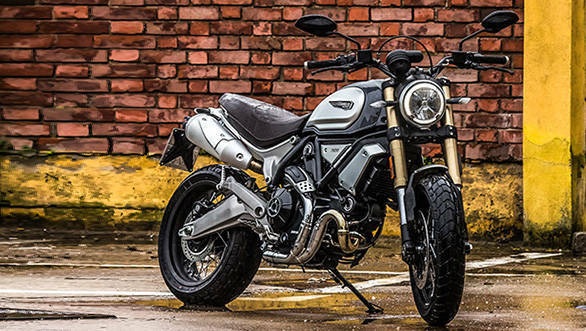 We've discussed all this and more in our detailed first ride review of the Scrambler 1100. The motorcycle is now on sale in India with prices starting at Rs 10.90 lakh ex-showroom and go up to Rs 11.42 lakh ex-showroom for the top Sport variant. But what are the differences between the variants? Read on. The base model gets the new 86PS/88Nm 1,079cc L-twin that's based on the Monster 1100's engine but with a new valve overlap and new throttle bodies. 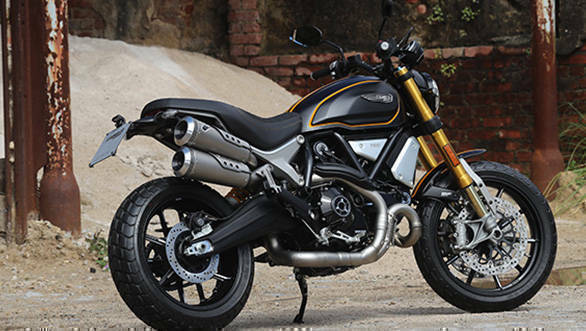 The tuning is for torque and smoothness and the peak torque arrives as just 4,750rpm and the curve is a vast plateau, especially compared to the Scrambler 800. The engine is hung from a new frame that creates a larger motorcycle overall than the Scrambler 800 in every dimension, from wheelbase, to width, to seat height, you name it. Bolted to this frame is an offset rear monoshock with preload and rebound adjustability, a Kayaba unit. There's a new aluminium subframe above the shock as well as a new aluminium swingarm behind it. The rear Kayaba is matched to a front 45mm (800 gets 41s) USD fork, also from Kayaba, but this one is fully adjustable. The tyres are the same Pirelli MT60s, an on-off road pattern tyre but the front tyre is now a 120-section unit. The brakes are Brembo M4.32 callipers up front, radially mounted of course. That's serious electronics for a retro-hip-roadster motorcycle no? All of this comes wearing a new, rounder, larger skin that looks more proportionate than the skinny-spartan Scrambler 800. Yours for Rs 10.90 lakh ex-showroom for the base model. The Special has everything the base model does, including the 15-litre fuel tank. But Ducati uses a lower, tapered handlebar for a slightly more tucked in riding position. The other change are the delicious looking spoke wheels. Now look closer. 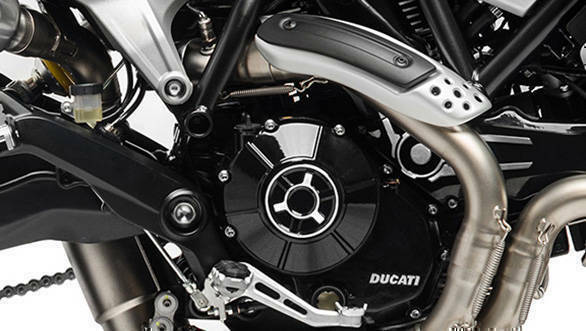 You'll see the series of brushed aluminium trim bits that Ducati uses to set off the moody blue-grey colour of the Special. So the tank side panel, the little radiator shroud, mudguards, the swingarm, all feature that same finish. The glitzy bit is the chrome header set on the Special. And we can tell you from experience that it turns a delicious blue once your ride the bike hard. Did we mention the retro-correct brown seat? The Special is priced at Rs 11.12 lakh ex-showroom, roughly Rs 20,000 more than the base model. The Sport is the top model, available only in a matte-black scheme with twin orange stripes. The same black paint is trimmed in the contrast colour in other places too. The swingarm is in black too. There is also a low handlebar - the Sport offers the sharpest riding position of the lot. On our test bike was the optional Termignoni, but the Ohlins suspension is standard. It's fully adjustable and it offers a better damped ride than the stock Kayabas although the base, Special and Sport are all stiffly sprung and you will want to find a gentler setting. The Sport is priced at Rs 11.42 lakh ex-showroom, which is Rs 30,000 more than the Special and Rs 50,000 more than the base. Great price for the Ohlins fork, eh?